Even before the release of D&D Next as an open playtest it became pretty obvious that Wizards was really intent on listening to gamers, gathering feedback, and making changes based on that feedback. That’s fantastic. It creates an opportunity for fans to engage in the process. I like that for many reasons, only one of which is the ability to influence the final offering. While that is pretty exciting and significant, my favorite benefit is that it helps fans think about how an RPG is made and helps all of us become more informed about the process, the challenges, and the impacts of various decisions. I’ve been fortunate enough to be part of the playtest from fairly early on. It helped me really think back on the different editions I’ve played and to even go back and explore (as I captured here and here) some editions I had never had the chance to play before. The history, complexity, and transformation of the game are all fascinating. Last night Wizards posted a Legends & Lore article on monster design. It should not be surprising to anyone that it received a lot of feedback, and much of it critical. Why? Is this a case of fans missing the point or is this criticism deserved? What does monster design influence, and in particular, how does what was shown compare? Perhaps just as importantly, what was not shown? As an early playtester, I can share that monsters have already progressed (in what I see as positive fashion) and that the progression has moved closer to 3E and 4E over time. However, just as was said in today’s article, the changes have been minor. This hasn’t been a point of emphasis. Today’s article may indicate that the design team has heard enough in the recent open playtest survey to make this a greater point of emphasis and solicit additional feedback. Excellent! In the article, Wizards shared the Next version of the Hook Horror. I found the article tremendously cool. It was fascinating to see the approach and compare it to what I’ve done in the past, both in home campaigns and with work on Ashes of Athas or DDI efforts such as the Ecology of the Vegepygmy. Impale An impaled target can escape by using its action to succeed at a DC 12 Strength check. 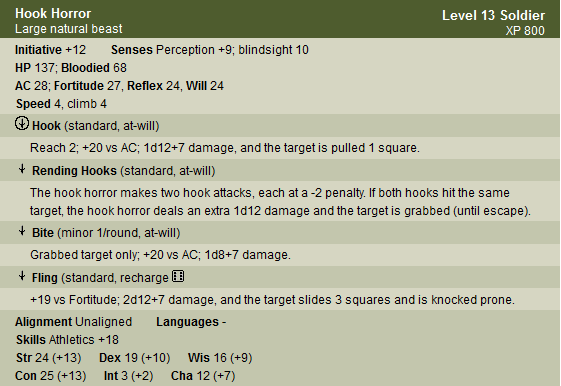 Twist and Bite Any creature currently impaled by the hook horror takes 1d10 + 4 piercing damage. 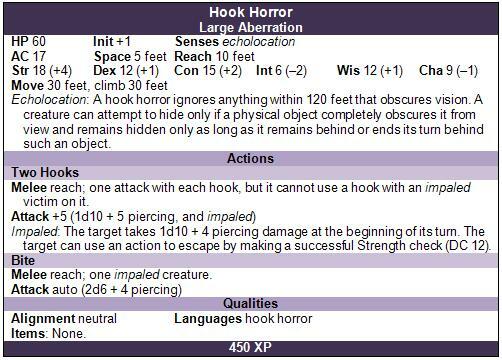 In addition, the hook horror can automatically bite an impaled creature for 2d6 + 4 extra damage. Echolocation A hook horror ignores anything that obscures vision within 120 feet. A creature can attempt to hide only if a physical object completely obscures it from view. It can remain hidden as long as it remains behind such an object or ends its turn behind one. 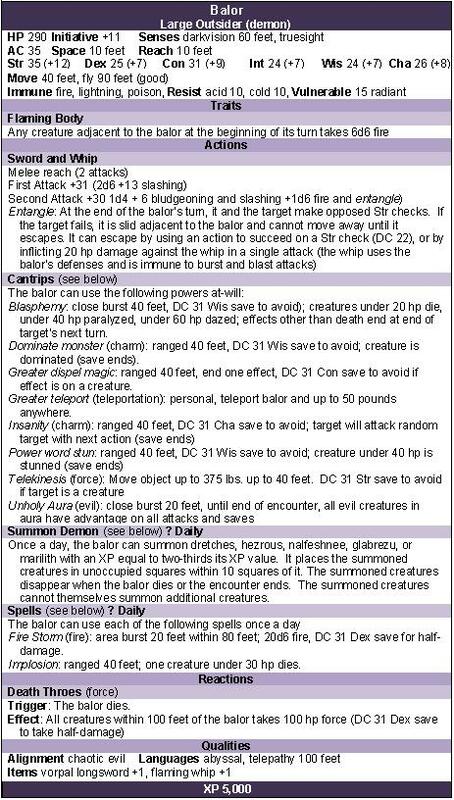 Note that 4E version is old design, dating back to the first MM. But, overall we can get a sense of the 4E logic. It is pretty clear how it works, even without the design improvements found in books like Monster Vault. Obvious stuff, like just one defense, lack of skills, etc. These are differences in approach, and have been discussed elsewhere (overwhelmingly in positive terms). Ability scores are far lower… less super-heroic in design?? 4E uses blindsight. D&D Next is a bit less rules-clear, instead necessitating what amounts to a trait, “echolocation”. If we look at the Rules Compendium, blindsight is basically the same thing. This is just a lot bigger (120′ is arguably a 3E throwback range, 50′ is the 4E version). There is no level in D&D Next. We get an XP value. It is far easier in 4E to know whether this monster is a good threat for a level x PC. The 4E version is 13th level, and any DM should know five of them are a great challenge for a 13th level party, easy for a 14th, inappropriate for a level 8 party, etc. We lose that clarity with D&D Next. 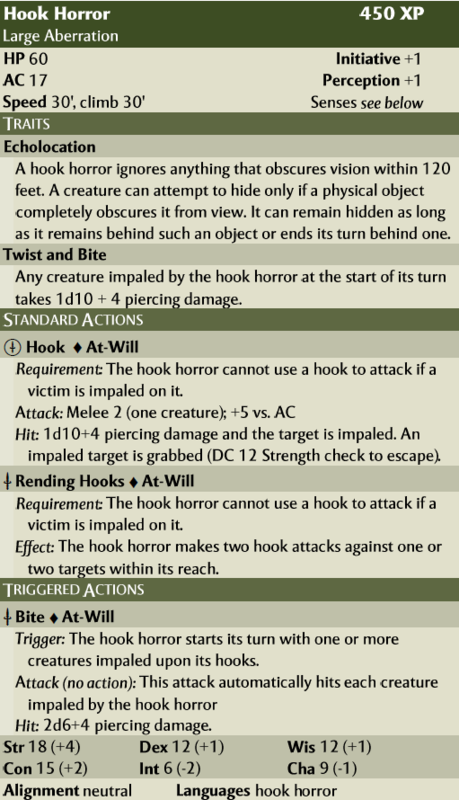 The 4E version hook attack pulls 1. D&D Next lacks that forced movement. The 4E version, especially owning to early 4E design, has a separate bite attack as a minor action with the condition of a grabbed target. (basically, an extra damage that makes being grabbed bad – that’s cool, because it creates a dynamic combat that evolves). The D&D Next version isn’t really clear. Is the bite supposed to be an action that always hits? Probably. But it wasn’t clear. For fun I made it a triggered no-action attack. I did that to illustrate the worst-case scenario that can take place when a DM doesn’t understand walls of text – a common problem in previous editions. Similarly, the Twist and Bite text isn’t clear with regards to the impaled damage… is that at the start of an impaled creature’s turn? I would guess so, so I made it a trait. This actually makes it pretty strong. If I compare it to other D&D Next monsters in the first open playtest packet… ouch! (Likely nerf/correction: the target makes a save to avoid the damage). I took a bit of liberty with using the typical 4E approach for double attacks (making a single attack as a basic). As written, the D&D Next version just has that double attack. But, since I’m not sure if a hook horror can charge and do the double attack I went with the traditional design. Comparing we see that the 4E version has an accuracy penalty and the D&D next one has a limit of losing attacks once it hooks an opponent. I like that, and it is a big evolution since initial D&D Next monster design, because it isn’t just swinging. The combat is dynamic and interesting with this monster. Impale is sort of extra text in the wrong place. Placing it in the 4E format cleans it up by placing it where it matters – when you get grabbed. Compared to 4E, it is a big deal to escape in D&D Next, as it uses your action (instead of just your move). The 4E version has Fling, a rechargeable big attack that does damage and knocks prone. There is no such D&D Next power. Losing rechargeable powers is perhaps positive – making the creature easier to run, but perhaps negative if a sudden fling would be fun. The following image captures some of the comparison in one single view and gathers some of the major comments. You can click on it to open a large image. Textual information. D&D Next loses the 4E standard format with sections. The monster is harder to run at a glance. Simpler. 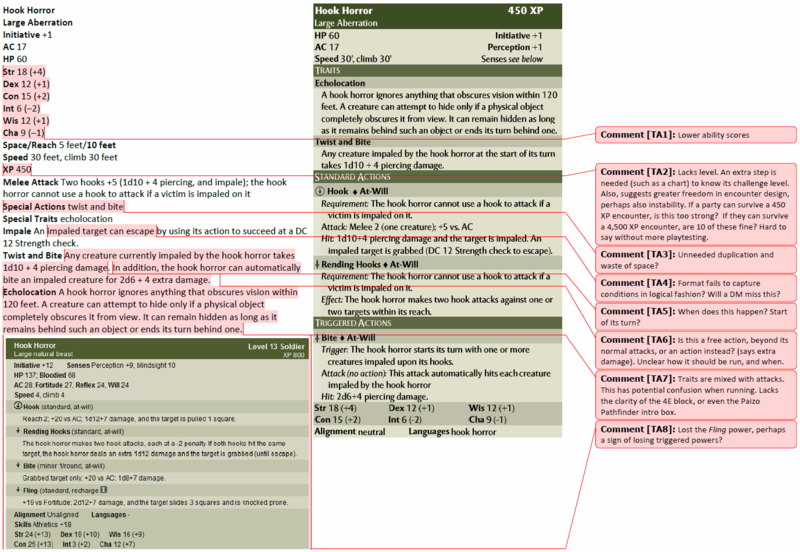 Outside of confusing bits of wording and the loss of 4E format, the D&D Next design creates a monster that is generally simpler to run (fewer attacks, fewer actions, etc.). Confusing. The use of textual information is a loss in clarity. Interpretation matters. We can expect variance between tables for the powers. This was very true of 3E and earlier editions, where DMs would run things differently by mistake rather than by choice. Arguably, the text format provides flexibility and may encourage greater story rather than fixed mechanics. This is debatable, and likely varies between DMs. From my perspective, I don’t find that 4E monster design lessened story compared to other editions. I would argue the opposite, especially if we agree that all monsters should come with a text description of ecology, mannerisms, preferences, and so forth. Loss of separable action types. What the monster does tends to be a no-action and an action. There is no clear trigger, aura, or similar language. This could make the monster faster to run, but less dynamic. No forced movement. Tactical play drops. If there is a pit or damaging terrain in the room, the monster will have to make an ability check (likely instead of attacking). Cinematic play drops. On the other hand, play isn’t reliant on a grid. My preference would be a system that supports both. I don’t see why a D&D Next monster couldn’t say “push close”, where ‘close’ would be a keyword with an equivalent grid measurement. A system like Adjacent, Close (2-5 squares), Distant (6-15), Far (16+) could easily support both styles of play and keep things dynamic. I can run theater of the mind and have a lot of fun with “push close”. I hinted at this above. All we know is 450 XP. Is that fine as a ‘solo’ for level 1 PCs? It sounds absolutely brutal for level 1 PCs with that auto-damage… but if you are on the playtest and have read the recent articles, you know that it is possible. Ouch! Further questions are even less clear: Is it ok to have two of them for level 3 PCs? How about 10 of them for level 7 PCs? 4E had a really clear rule: things had levels. Powers, monsters, traps, terrain, encounters. You matched them up, or at least within a few levels. Done. That simplicity looks to be gone. That’s a serious loss. We gain flexibility, but we have to see a lot more before we know this flexibility works. I’m not convinced. In a playtest of D&D Next I tried to recreate the final battle in the Moathouse that leads to the Temple of Elemental Evil. Lareth the Beautiful was a Dark Priest. He was supposed to come in after a few rounds of combat between his guards and the PCs, but by the PCs quickly gained the upper hand. He was basically a solo… and it was a slog-fest. It felt like early 4E in that he had only a single action, but his ‘XP value’ was such that he needed to hold his own against 5 PCs. He sort of did. His attack was strong, but his spells were too easy to resist, and his power-ups ate away precious rounds. It was too long and too low on threat… even with his built in terrain feature. This hook horror seems to offer the same. While possibly flexible, we quickly get into judgement calls, DM experience, etc. Right now, this is a big area where I want to see 4E’s innovation. The hook horror is a simple beast. It has huge rending hook-claws and a bite when it grabs you. Both editions capture that really well. What about a simpler monster, like an orc? 4E has some incredibly awesome orcs (my favorite may be one from the Siege of Gardmore Abbey special adventure, where they start as a swarm and when bloodied become 4 minions… I stole that idea and used it in my May of the Dead entry). Any monster that is too simple: add a monster theme power! Any monster that is too complex: remove a power! This is night and day compared to previous editions. In 2E and before that, you had an orc with a weapon. Done. Okay, maybe a chieftain with more hit points and an attack and/or damage bonus. In 3E you added levels, a laborious process where you had to basically make a mini-character, figure out equivalent levels, etc. In 8 years of organized play, including writing a few adventures, I made monsters for exactly one adventure. I hated the process. In 4E, I’ve made countless monsters and the ease of monster and encounter design has helped me become deeply involved in organized play. Orcs had cool powers for charging, for attacking when killed, and for differentiation by role. Kobolds and goblins had racial powers most DMs can name by memory because they were instantly iconic. For a good example of role differentiation while thematic to the race, check out Monster Vault’s minotaurs. Excellent. Previous editions lacked this. You had the orc, the one orc chieftain, and then a few weird variants around women and kids (let’s just assume that one won’t make a comeback). Again, the difference was usually hit dice (hit points, attack, maybe weapon die size). I really hope we see 4E’s interesting encounters. I don’t want to fight 30 orcs that are basically wire-frame puppets with a certain armor and weapon. If one cave has orcs and another has goblins, the two should feel different. There is a lot of room for compromise. Maybe we drop roles, and maybe we simplify stat blocks by removing extraneous powers and complexity and action types, but retain the core idea: a clean intuitive format, a racial power, a cool attack that might change by exact creature type (orc guard, orc basher, etc. ), and maybe one conditional bit (like charging when you die). That would be simple, evocative, and fun. I’m really fine with Vancian magic. Losing the power you memorized/studied is a neat concept. It is iconic. It is old school. 4E had Vancian magic in various forms (and extended it to all power sources). It’s cool, and I’m a fan. Where I draw the line is with monsters. The problem is two-fold. First, you will soon hit a spell you don’t know. What does “Wrath of the Titans” do? You have to stop the game and look it up. This happened running D&D Next. That Dark Priest has spells, I had to stop and look them up, and they all were standard actions. 3E really suffered from this. Players have to lug tons of books around (or carry pirated books, or have internet, etc.). In 3E organized play gamers would carry suitcases with them. 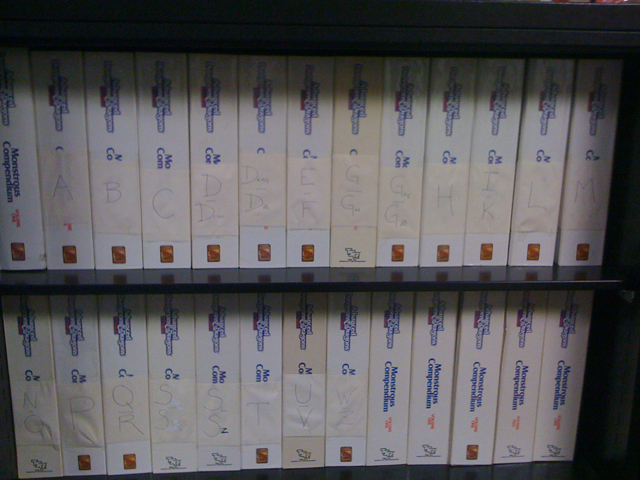 I used photocopies and then cheat sheets with really small font and abbreviations. The second huge problem is the effect on the casual DM. You are running an adventure for level 15 PCs. They reach the top of the wizard’s tower, and there is the evil wizard. In 4E, she has a stat block. The powers have bigger numbers, but the logic is the same. A casual player can run that monster. In previous editions, the evil wizard is actually a level 18 wizard… with a full spell list. You have to either stop play and flip through books or actually know all of these spells already. As the edition grows it becomes harder and harder to know all the spells and you have to work off of an index of spells and carry all the spell-containing books with you… especially since older edition spell design often required interpretation. Magic Jar? Good luck running that from memory. Maze? Even magic missile, for the number of missiles at various levels! Durations, contingencies, interactions with other spells… it was a mess when you then added that onto monsters. I can add a third problem. Ideally you want any player who would consider becoming a DM to want to be a DM. You don’t want barriers. Similarly, any player or DM that wants to create should be able to create. The problem with 2E and even 3E is that there were too many judgment calls. How strong is Impale, or Twist and Bite, or Echolocation? If it isn’t obvious, then the game is too hard for the casual gamer to tinker with. 4E created a common shared language, powering blogs, online discussion, and the like. That falls apart when created content is inferior because the skill set to create balanced monsters is too unattainable (or worse, is simply subjective with no true form). You want the edition to encourage tinkering. You want lots of players to want to go deeper down the rabbit hole and to further sell the edition. I like the idea of simplicity. I like the idea of making monsters more than a stat block. But the cost of the current design is too high. Changes like we see between the hook horror’s 4E and D&D Next versions go far deeper and wider than how Twist and Bite works. This extends to the very underpinnings of the game: Is the game accessible? Is an encounter with many orcs interesting? Is a solo fun? Is a monster truly flexible across several levels of PCs? Is it easy and fun for a DM to build encounters? Is it easy for a DM to prep encounters and even run them cold? Can the DM easily modify the monster, build one like it, and understand how it fits into an encounter? Does the DM have to carry many books to be able to run it, or is it self-contained? Monster design and encounter design are two of 4E’s greatest strengths. The innovations are many and significant. In looking at D&D Next’s hook horror I see many steps back from those innovations. What we gain in return seem far too little to be worth the trade. Look for simplicity, absolutely. We want the game to avoid needlessly complex monsters. Avoid traps, where it looks like a monster is appropriate for a certain party level but it actually isn’t. 4E handled this in superior fashion. Keep the 4E visual appeal. Even Paizo emulated it for their starter box. It really helps DMs (from casual to experienced) run the game quickly. Minimize the number of powers, especially triggers. Keep the idea of species iconic powers. A goblin and an orc are more than the armor they wear or the weapons they wield. Consider 1-2 other powers at a minimum that keep combat interesting and also tell the story of the monster. The D&D Next hook horror does this well. Avoid text blocks that require interpretation create confusion. The story of the monster should be told primarily through the text around the stat block. The stat block can be evocative, but not at a loss of clarity. Turn spells into powers. A DM should be able to run every monster without opening another book. Avoid class levels for monsters unless you have a simple system. 3E construction turned away DMs, creating barriers to entry. 4E created DMs and authors. Monster and encounter construction should be attainable for casual DMs and players, encouraging internet discussion/collaboration and the entry of new gamers (and even organizations and companies) into the fold. Really interesting. I especially like his Balor (linked at the end). It has a promise of potentially being able to handle spells (though will run into issues if monsters gain spell-casting classes, as I mentioned in my follow-up blog on monster desgin in organized play). 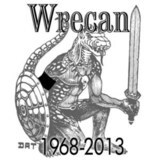 This is a good time remember Wrecan, who passed away. He made D&D a better community. This entry was posted on October 14, 2015 by Alphastream and tagged 3E, 4E, 5E, Challenge Level, Monsters, Playtesting, RPG History.